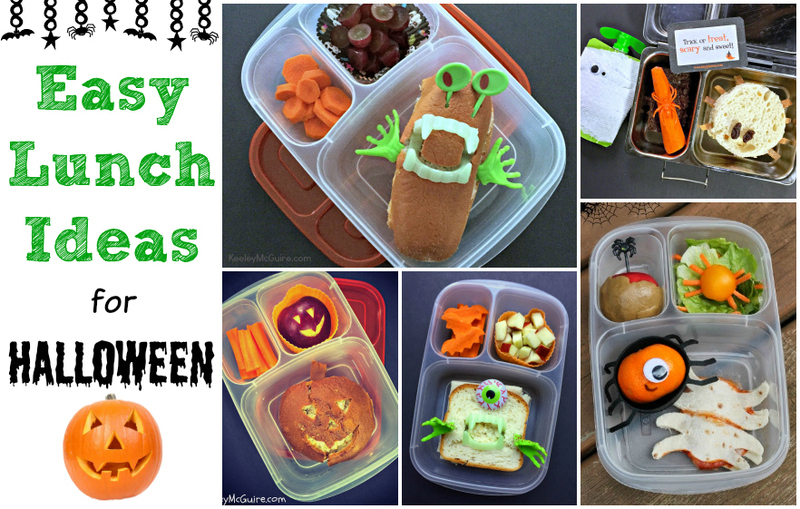 Gluten Free & Allergy Friendly: Halloween Lunch Box Ideas using #UdisGlutenFree! 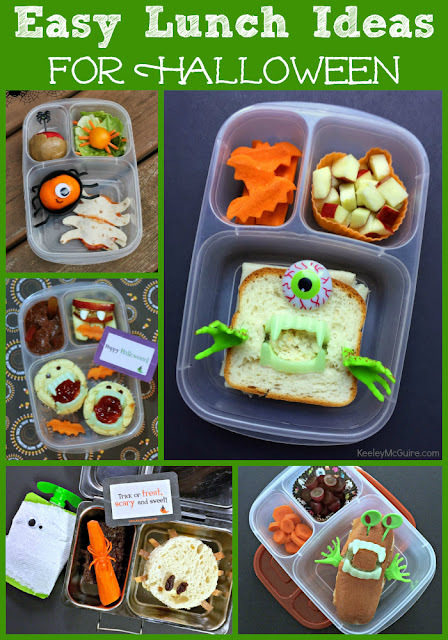 Halloween Lunch Box Ideas using #UdisGlutenFree! 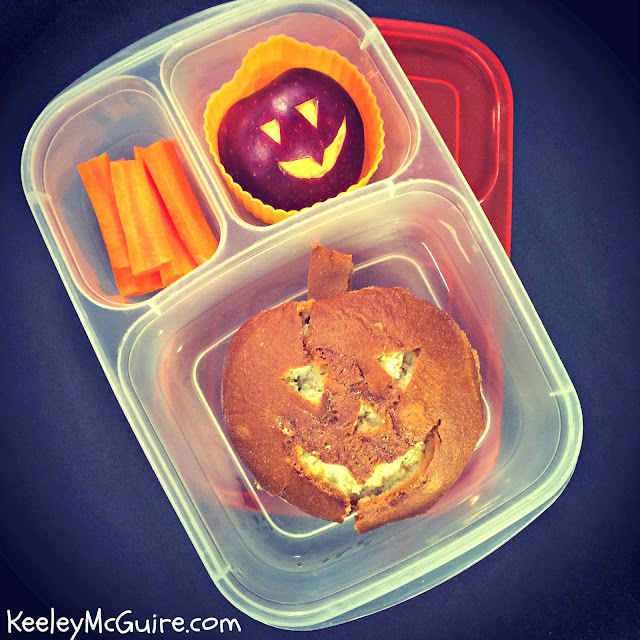 Halloween has to be one of my most favorite times of year, especially when it comes to creating fun lunches! The fall, crisp air... lots of baking, yummy smells, hooded sweatshirts, football, and decorating (even in the lunch box). 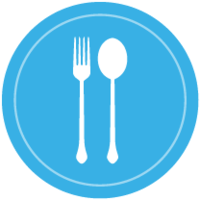 I'm going to show you eight easy lunch box ideas using Udi's Gluten Free products that can bring your kiddos both a laugh and a full belly! Little Miss loves her silly sandwiches I make her and this one is no exception! So simple too. Using a round cutter, I cut out my Udi's Gluten Free bread slices and filled it with sunflower seed spread. 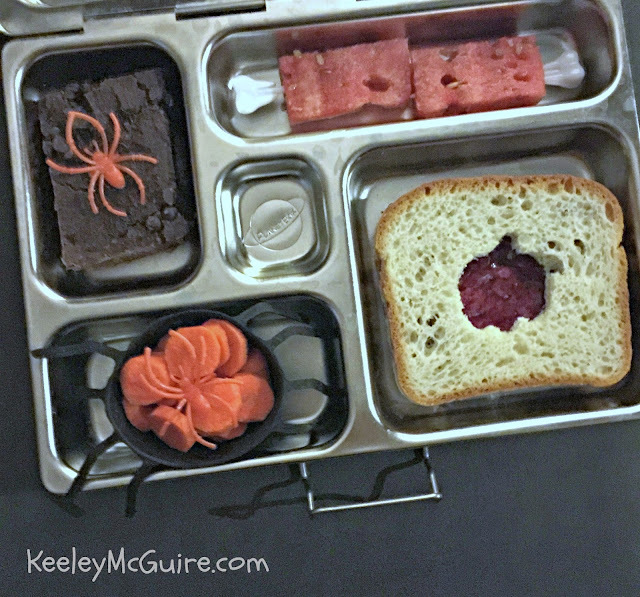 I then took the crusts and cut them into small strips to create the spider legs and stuck them inside the sandwich. Don't worry, the spread helps hold them in place like glue! Using a dab of honey, I adhered two raisins to the top to create the eyes. Again, the honey acts like a glue to hold them in place. 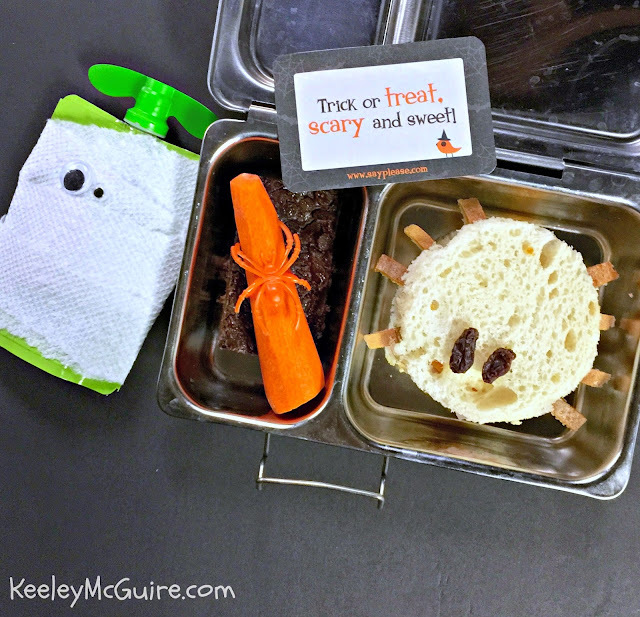 Finish lunch with your kiddos favorite sides and include some fun Halloween accessories, like spider rings, which make it fun and interactive. A little impact can go a long way, like here I made a small pumpkin cutout on her Udi's Gluten Free bread slice to reveal her jelly underneath in her sandwich. A simple way to add a fall theme and pop of color to an otherwise boring sandwich. Let's take that sandwich and Udi's Gluten Free bread slices a step further by creating a MONSTER of a lunch! 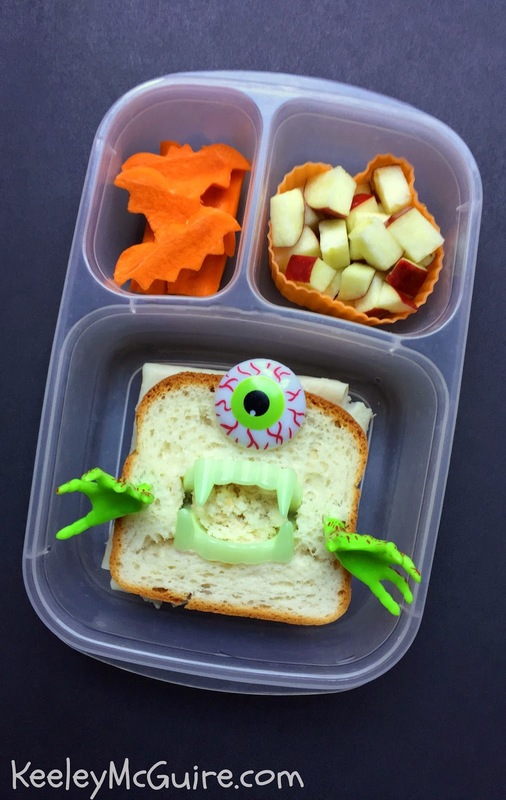 A simple turkey sandwich is now a scary & silly sight thanks to fun food picks, plastic vampire teeth, and an eyeball cupcake ring. It seems like whenever we have burgers or hot dogs, we always have one or two buns leftover that need to be use before they go to waste. That's when I love to get creative for lunch with them! Here is simple cut out the top layer of an Udi's Gluten Free hamburger bun with a paring knife to reveal a jack-o-lantern face on her turkey sandwich inside. An Udi's Gluten Free bagel was used to create this spider web pizza for lunch. Simply add the sauce and toast. Then place the cheese shreds in a web pattern and toast again until slightly melted in the oven or toaster oven. I then added spider rings to make it look even more creepy-crawly. 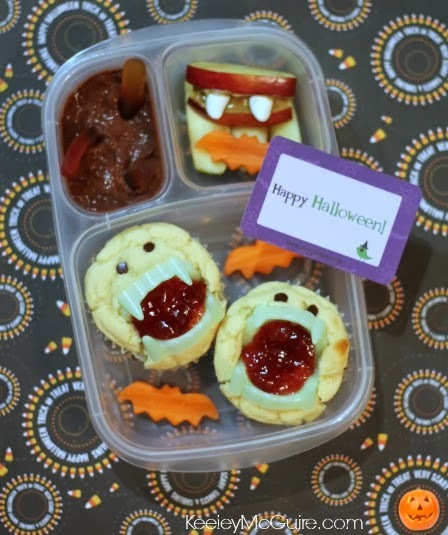 A bit of jelly and your favorite muffin can create quite a scream for lunch! Udi's Gluten Free makes delicious muffins in six varieties + two muffin top varieties. 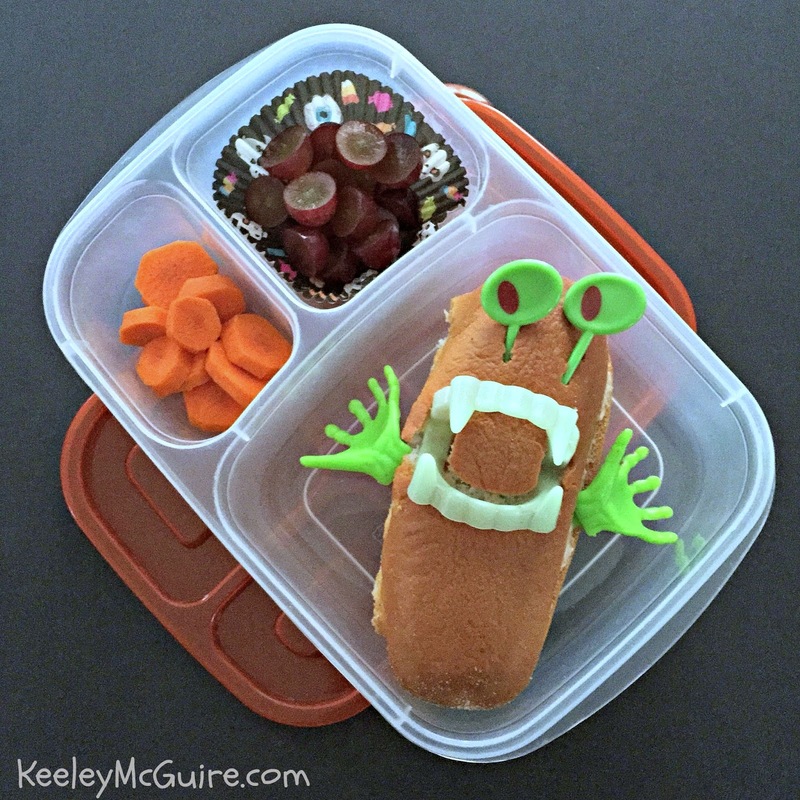 Add the plastic vampire teeth, fill the mouth with strawberry jam, and add mini chocolate chips for the eyes to create these "vampire muffins" for lunch! 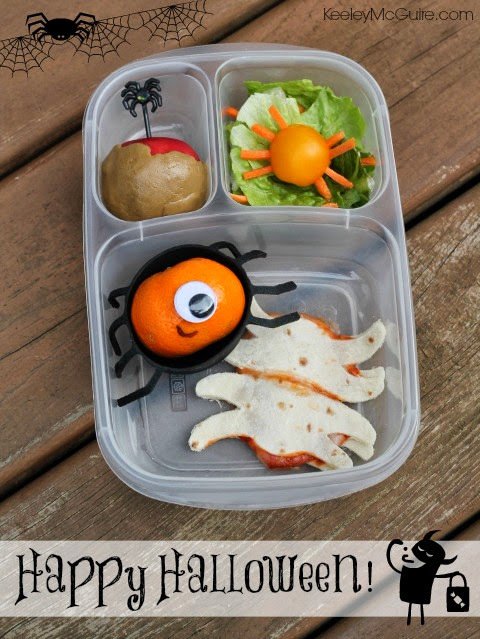 Using tortillas is another great way to create fun shapes and fillings for lunches. By using a spider shaped cookie cutter on Udi's Gluten Free soft tortillas, I created the shape then filled it with pizza sauce and cheese (then heated in my toaster oven to melt the cheese) to create the fun spider themed lunch. Curious about the products we use and love? Check out our Lunchbox Goodies page for more information!